WINNERS! WINNERS! The winners of last week’s blog with Mari Mancusi are: Diane and bn100. Please email me at: christie (at) christie-craig.com and let me know if you’d prefer print or e-book and either your snail mail addy or if you’d prefer Amazon or B&N for e-book. Congrats! Mother’s Day has just passed us, and a couple weeks ago, something happened and I was reminded of the amazing power and devotion that stems from maternal instincts. Instincts that aren’t just human, but are found in all animals. Yup, squirrels are mamas, too. I was doing what I do most of the time. Working. Lady, my junkyard dog, was resting on my office sofa, gazing out the French doors that overlook my backyard. She wasn’t just being lazy. Oh, no, she has a job to do. She is forever on squirrel duty and takes her job very seriously. Ahh, but this day she was quite tired from destroying another of her doggy toys, this one a stuffed squirrel, that she’d managed to sneak outside. You see, Lady is anti-squirrel, and I think she got too much joy ripping the toy to shreds as all the yard squirrels watched on. Now, she’s a wonderful dog as long as you aren’t a squirrel. Anyway, while it was a pretty day, blue skies and puffy white clouds, the wind had kicked up. The strong gusts sent the trees dancing and the innards of the stuffed squirrel were strewn across my yard. Then I heard it. A loud thump, like a small tree limb hitting the ground. Lady, ever attentive to the outside world, bolted to the French doors. She stood there, her attention riveted. I went to let her out, but something gave me pause. She was too eager. So, I squeezed out the door, forcing her to stay inside. I spotted the reason for her eagerness. There, on my concrete patio, was a broken nest of sorts. And outside the nest were four baby squirrels. My stomach clutched as I drew near, thinking the fall had killed them. But nope, they were all breathing, just too little to run away. Lady whined behind me at the French doors, anxious to come out and do her squirrel duty. I stood there trying to think what to do. I had to let Lady out sooner or later. Right then a loud noise erupted—a half cry, half scream. I looked around and there, clutching a nearby tree trunk, was another squirrel. I knew that this was the mama. I could hear the panic and devastation in her loud chirps. Her babies were in danger and could even be dead. I stepped back. “I’m not gonna hurt them,” I assured her, and my heart hurt for her. But was there anything I could do? Since I knew squirrels weren’t like possums that could hang onto their mama’s back, and these babies were too young to climb, I imagined the worst outcome. Her babies weren’t going to make it. 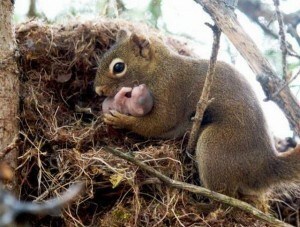 And from the heartfelt sounds she made, the mama squirrel knew it, too. And bam, just like that, I remembered when they took my five-week premature son into surgery. The fear, the heartache, I felt was as real right then as it was years ago. Feeling helpless, yet desperate to help, I went inside and called my hubby, wondering if I should collect the babies and take them to the wildlife vet. He didn’t answer his cell phone, so I started to go outside again, but a movement outside the window had me stop. The mama squirrel had rushed to her babies, sniffing and nudging them with her nose. Then what she did next completely surprised me. She opened her mouth and stuffed a baby inside. Even though it appeared impossible, she got the entire little body in there. With only the baby’s tail hanging out, she climbed back up the tree. It wasn’t an easy climb, once or twice I worried she would fall. She would stop as if to catch her breath. It appeared as if she’d either found an empty nest or had just borrowed a friend’s nest to leave the first baby. Then, one by one, she collected the others. With maternal strength, she saved what was most precious to her. Her babies. With all her squirrels out of harm’s way, she skittered back down and started gathering items to help rebuild a new nest. Oddly enough, she collected a lot of the stuffing from the toy squirrel. For some reason, that felt like poetic justice, though I wouldn’t tell Lady. And I kept my squirrel guard dog inside, allowing the still panicked mama all the time she needed to do her work. I’ve never seen a squirrel work so hard. Lady wasn’t happy I’d kept her from her job of ridding the yard of squirrels, but I knew the mama squirrel was ever so grateful. And it just reconfirmed what I’ve always known. There is nothing like a mother’s love. Aw that is a sweet story, it would have been amazing to witness. Goes to show you that Momas are the best!!!!! What a sweet story. I will trade you my ground hogs for your squirrels. We have been trying to trap them because they are making tunnels under our building. So far we have trapped four raccoons and two opossums but not one ground hog. We see the out in the yard eating but they want go in the trap. What a beautiful story.. We forget that even though some animals in the wild can be pest, they are still momma’s and will doing anything to protect their young. Assalamualaikum kak Roza,semuga kak Roza dan keluarga sentiasa di dalam peliharaan Alhba..suahhnallal, peringatan yang menakjubkan..terima kasih berkongsi idea dan ilmu..